THE NAKED CITY – THE SYDNEY FOOTBALL STADIUM DEMOLITION SPECTACULAR! Posted February 27, 2019 by Coffin Ed & filed under Arts & Entertainment, The Naked City. 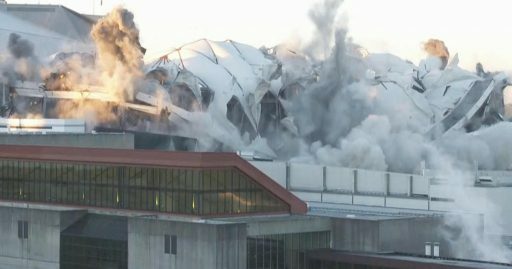 You have to feel for architect Philip Cox, as despite a temporary legal injunction, the wrecking ball hovers ominously over his Sydney Football Stadium – a mere 30 years since his innovative design was first realised. It’s almost akin to watching an innocent man on death row, waiting in vain until the final day of execution. Little wonder that Cox was quoted recently in the Sydney Morning Herald, stating that the impending demolition shows “a certain philistinism” in NSW. Last year in this column I recalled the fate of Sydney’s once magnificent T&G building, which when constructed in 1930 was the tallest ‘skyscraper’ in town with no less than 12 expansive floors. When it was opened by the then premier Jack Lang, amongst considerable fanfare, he declared that it would stand as an icon of the city for another 100 years or more. Less than five decades later and it all came crashing down to make way for a soulless edifice of concrete, glass and steel. Flashback to Sunday, January 24, 1988, and the same sense of civic achievement abounded with the ‘Sydney Football Stadium Opening Spectacular’ and a proud Labor Premier in Barrie Unsworth. Needless to say, the night time entertainment extravaganza was the hottest ticket in town with a roster of performers that included Julie Anthony, Dragon, the Eurogliders, Sharon O’Neil and US superstar Henry John Deutschendorf Jr., better known as John Denver. It was a different era of course with the major sponsor of the event, Winfield cigarettes, looming large at every opportunity. The Berejiklian government now seems indecent in their haste to knock down the 30 year old stadium and the Labor Party equally determined to halt the madness and consider how the $730 million allocated for the redevelopment might be better spent. In the meantime, many of those opposed to the destruction have been plagued by an imaginary yet nevertheless totally nightmarish scenario – THE SYDNEY FOOTBALL STADIUM DEMOLITION SPECTACULAR! It’s a Sunday night in Sydney and all roads lead to Winfield Stadium with the temporary ban on cigarette advertising temporarily lifted for the night. The old football arena is about to come tumbling down but not before the ‘powers to be’ extract every bit of kudos out of what those noisy protestors see as a monumental act of vandalism. It’s standing room only – hey all the seats have long been ripped out – and there’s a real buzz in the air as international superstar Meatloaf is welcomed by the Premier and takes to the stage to reprise his memorable performance at the 2011 AFL Grand Final. Images of the brand new $800 million plus stadium are projected everywhere as kiddies besiege the Winfield bikini babes handing out free chocolate fags. There’s a real feeling of reconciliation in the air as a repentant Rolf Harris is welcomed to the stage to perform a special wobble board version of the national anthem. Gary Glitter and R Kelly have had to cancel but there’s still an impressive list of big name artists to rev up the crowd, as a massive Mexican wave envelops the stadium. All the time a giant clock is counting down to that ground zero moment when one lucky punter, chosen through a statewide ballot, gets to press the button that implodes the once much loved Sydney icon. Yes there’s the mandatory fireworks, a massive laser display and a parade of former Rugby League legends. Within minutes the crowd has evacuated to a safe area in Moore Park, complete with jumping castles for the kids, free pill testing and multicultural food trucks. The button is pressed and the once mighty stadium implodes in a massive whirlwind of choking concrete dust – one that can even be seen from the International Space Station. Unfortunately, the disintegration takes out half of the neighbouring Sydney Cricket Ground as well. Whoops!